Perhaps because I grew up in Australia, a country with a past so young, I have always been awed by history. Twenty years ago, I moved to a rural French village and found myself steeped in antiquity, age-old culture and monuments. Writing about all this became, unconsciously at first, the next logical step. Surrounded by history certainly gives me ideas for stories, but it is also the local people, the fairs and festivals of this agricultural pocket that provide excellent fodder for tales. Take, for example, Georges. Every Saturday morning, Georges lugs along to the marketplace a strange-looking bicycle. And there he sits, all morning, amidst the convivial banter, the punnets of raspberries and strawberries, and the boudins and saucissons displayed like plump limbs, cycling in earnest. But he never leaves his spot. Vestige of a profession dating back to 1300, Georges is a rémouleur, (knife sharpener or grinder). 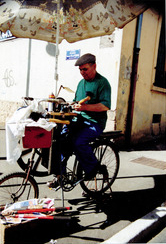 Exercising his activity in the village streets, the grinder proposed his services to sharpen knives, scissors and razors. ‘I’m a carpenter by trade,’ Georges says. ‘I had to sharpen my tools, so I taught myself, and adapted my own bicycle, he proudly adds, caressing his slate block with a dangerous-looking Opinel. At the beginning of the 15th century, grinders had the privilege of sharpening cloth shearers’ scissors. Charles IV granted the trade definite status and the rémouleur joined the cutler profession at the end of the 15th century. The rémouleur’s equipment developed over time to become relatively sophisticated. In the beginning, a simple frame fitted with a heavy sandstone grindstone was used. Later, a wheelbarrow made transportation less tiring. The rémouleur added a water reserve to lubricate the grindstone, then the famous pedal made its debut, permitting him to work the grindstone with his foot. This trade lived until the middle of the 20th century. Then, the quality of steel and its treatment meant that there was less call for sharpening. But it is not only colourful characters from the past, like George who season stories. 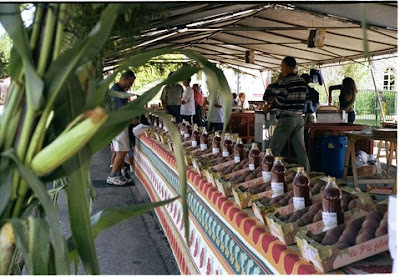 In any rural French village, an abundance of events, fairs and festivals gives the writer inspiration. One I know well is the bush peach festival, held on the first Sunday of every September. What’s the big deal about peaches, you might well ask. Well it’s not just simply a succulent fruit with flesh the colour of blood. The bush peach is grown alongside the grape vines. Susceptible to the same diseases as the vines but quicker to develop the signs, the vine growers plant peach trees next to their vineyards to warn them of potential problems. The bush peach has been part of the arboricultural patrimony of this region since the seventeenth century and, despite its questionable history as martyr, even the humble peach is firmly anchored in the village history. Another annual event, the fête des classes (class party) also intrigued me. I first learned of the class party when I found a stranger standing on my doorstep in a pointed, green hat sporting a real feather. He was clutching a bag of French pastries. ‘Would madam like to buy a brioche?’ he said. I asked why he was selling brioches door-to-door. 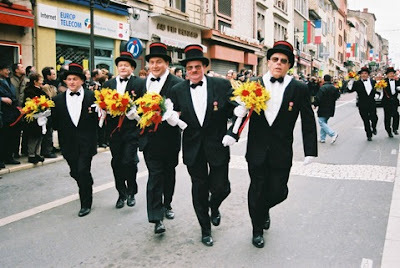 ‘To raise money for the fête des classes’, he said, and when I raised my eyebrows in obvious incomprehension, he recounted the tale of this curious French tradition associated with conscription. It began around 1850, in Villefranche-Sur-Saône, when two friends decided to celebrate their 20th birthdays wearing tails and opera hats. They were returning from the drawing of lots, a system of chance used to select army recruits and they were such a hit that, in following years, other conscripts imitated their attire. Gradually they were joined by men of all the other decades. ‘But why celebrate an event so linked with doom?’ I said. ‘Friendship, brotherhood and solidarity!” he exclaimed. So now I know what’s going on when waves of men weave along the main street once a year. In lines of six, or fewer as the older ones die off, all slickly coifed and armoured in tails, bow ties and opera hats streaming different-coloured ribbons for each year, the cavalry zig-zags along, accompanied by an artillery of trumpets, trombones and flutes, and ranks of cheering family and friends. And while these festivities no longer mark the final celebration before departing for the uncertainty of war, the bonds of brotherhood are reinforced annually, uniting men (and now women) who, for a brief moment, know no racial, class or social boundaries. 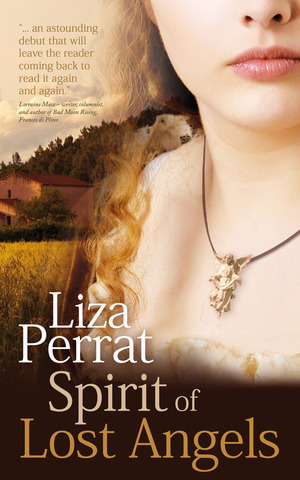 All these engaging people and events aside, my foray into historical fiction writing didn’t actually begin until several years ago, when I was out walking in my village. On the banks of the Garon River, I came across a small granite cross named croix à gros ventre (cross with a big belly). Engraved with two entwined tibias and a heart shape, it is dated 1717, and commemorates two children who drowned in the Garon River. My curiosity was piqued. Who were these children? How old were they? How had they drowned, and where are they buried? I felt the urge to write the story of these lost little ones –– to give them a family, a village, an identity. My agent is currently trying to sell the second book in the series, and I’m busy planning the third. I’m very excited about entering the world of historical fiction, which I might never have dreamed of, had I not met my French husband, and come to live in a rural French village. 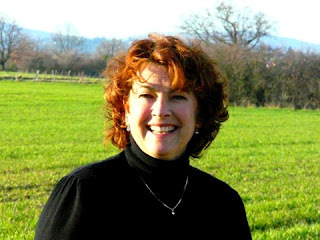 I totally missed the fact that you are an Aussie living in France when you contacted us! You are very lucky to be living in such a fabulous place! I am focussing on all things French this month on my blog, so this post is very timely! Gorgeous - I feel like I've been on a holiday. Thank you. Great post. It felt like I was walking by your side.